Currently being brought into the fleet are brand new 2011 Chevrolet Caprice interceptors, these iwll replace parol cars 3 5 and 6, which will be renumbered and made into spare units. That's smart. Will it be the same for us when we get new trucks? 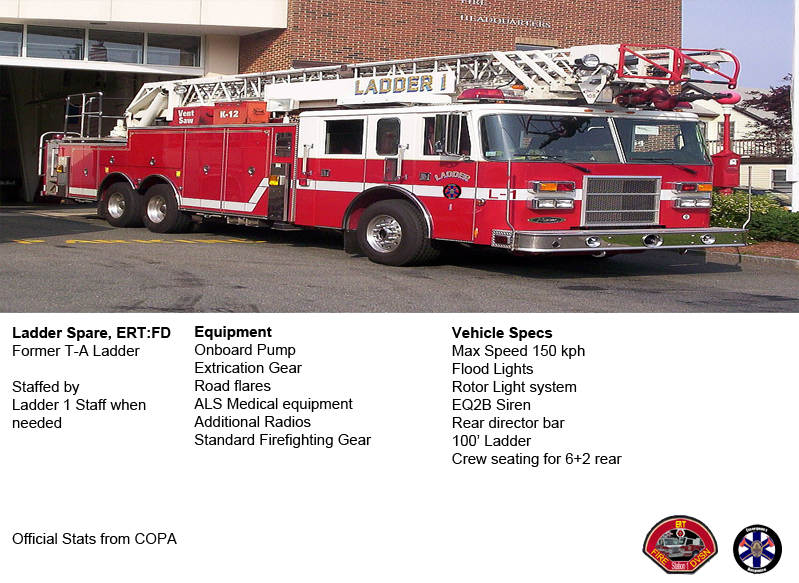 Updated with Spare Fire Units. Is it bad that the spare ladder looks nicer then the normal ladder? Well, I wonder when we'll be driving the spare! Are they parked in bays in the station? M. Cressler wrote: Is it bad that the spare ladder looks nicer then the normal ladder? Yeah I sure wish we had a tower instead of a stick. Besides, the towers can have 2 water cannons. 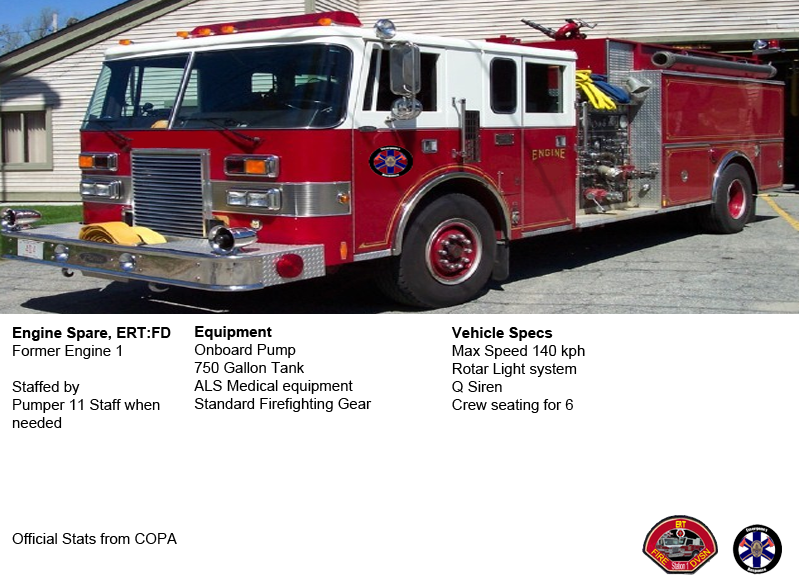 What do the spare EMS units look like? 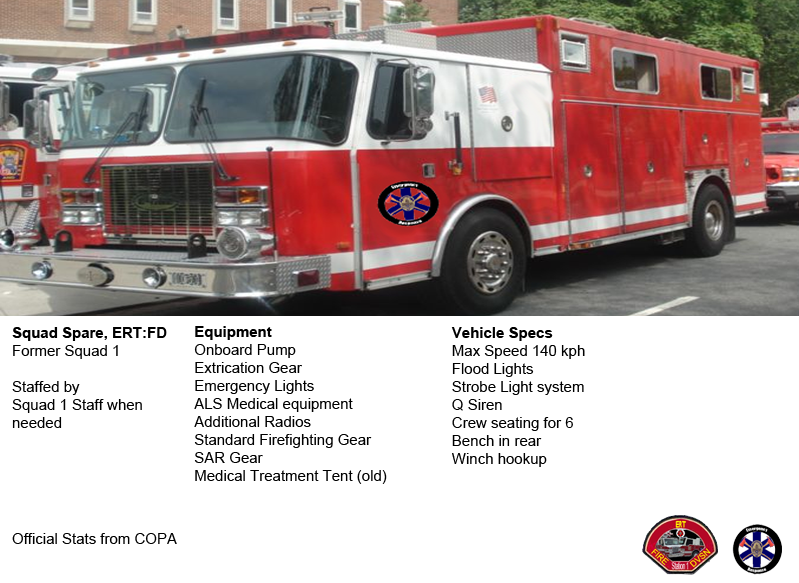 Or do we just use one of the other ambulances we have right now since they aren't being used? Cool, thats kinda what I was thinking would happen. Thanks Moon. what if the sevs break down? You'd probably either go OOS, or just chuck your gear on another truck, or maybe a pick up truck, who knows. To be honest, because the SEV's are SUPPORT units we would not really need a spare unit. I think they would be more for frontline units rather than support units. Repair them/ buy new ones. What does "OOS" stand for? If a SEV breaks down, which would be SUPER unlikely, since they are seldom used, and maintained very frequently, units will either respond to extra personnel calls in a designated POV, however if it's for the equipment, then the needed equipment will be transferred to a seperate unit and brought to scene, however if it's only a minor problem, such as windows don't work, a light is gone, siren function 3 doesn't work, etc, then we'll send the SEV anyways. If an RA, which sees much more action gets out of service due to a problem, they would be staffed on an extra regular ambulance while repairs take place. Maybe TAC members could use the spare Crown Vic's for regular patrol duty when we are not working TAC duty? This would eliminate the need to issue POV's to all TAC members, and it would also give the poor spare units rotting away in storage a new purpose. I assume we could work out some way of coordinating the vehicles. I came to think of it with the new member additions to the TAC squad, it might be beneficient to have us working patrol duty when we are sitting idly on our asses. We can reassemble at the HQ in the event that we are needed for the TAC role anyhow, just like we do now. well you can go on patrol in your POV to I use to when I was a TAC SGT. A note on this; I think our TAC-cars already have TAC on them? Also; I'd like to have the spare units (if you decide to go with my suggestion) marked as regular police cars, and not add TAC. The reason for this is that we're not really fullfilling a TAC role when patrolling the streets, we are merely working as "regular" police officers and we don't need to emphasise on our special training/unit coherency when doing that. M. Cressler wrote: well you can go on patrol in your POV to I use to when I was a TAC SGT. - eliminate the need to issue POV's to every single member of the TAC. - reduce the amount of non-uniformed vehicles at crime scenes. - allow the spare units to be actually used, and not go to waste. This should be continued in the Quarterly forum, however my idea on that, is, like most cities, TAC members are given patrol cars, yours are usually unmarked or very little marked. We only have one active unmarked patrol unit, so TAC then covers the rest. 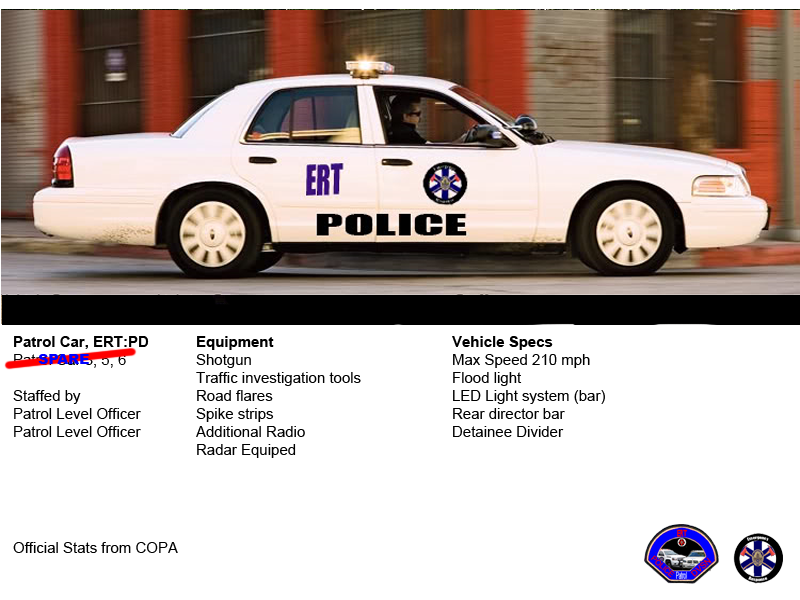 I'm gonna look into it, but I'm thinking it'll be Regular POVs for all, a marked TAC police unit for Commanding level officers, a regular marked patrol car for regular TAC officers and snipers and for scouts and negotiators, they'll be given unmarked, or barely marked patrol cars. Very well, I am excited to see your solution to this. Thank you for the swift consideration!